When it comes to your high end home, you want it to stand out. You want it to look beautiful both inside and out. To make a home truly one of a kind, the details matter. Small touches such as copper rain chains can mean the difference between a standard home and one that really “wows”. Copper rain chains compliment an existing home exterior. Many homeowners appreciate how well copper rain chains compliment their existing gutter system. They seamlessly blend in with many different types of finishes. They also add style and elegance to an otherwise standard design. Enhancing its appeal, copper rain chains can add visual interest to a plain exterior. 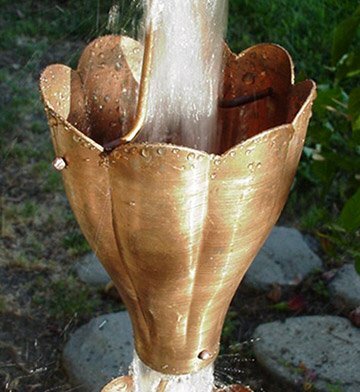 Copper rain chains are a beautiful downspout alternative. Want to safely channel the excess rainwater away from the home but don’t like the boring look of standard downspouts? Copper rain chains combine the functionality of the downspout with the beauty of a decorative finish. Our copper rain chains come in many styles to compliment any type home. Grape and Leaf Cups – Looking for a hand-crafted rain chain that adds style and elegance to your backyard? Look no further than the exquisite grape and leaf cups rain chain. This new design gains even more beauty as the copper begins to patina over time. Double Loops – More than just a rain chain, the Double Loops style is a piece of art. It’s exquisite detail and thick copper rings make a stunning addition to any gutter system. Each ring has a 2” diameter. XL Scallop – The largest rain chain on the market, the XL Scallop can handle heavy water flow while still looking beautiful. Each of this chains cups measure over 4 inches wide and 5 ½ inches long. Arts & Crafts Cups – Looking to enhance your existing craftsman home? How about a great-looking Arts & Crafts copper rain chain? We carry three styles to ensure you find the right match for your unique needs. The history of the rain chain runs deep. In fact, for nearly 3,000 years the Japanese have used rain chains as ornamental fixtures in the home. Most were crafted of traditional copper and enjoyed for both their beauty as well as their function. The Japanese were attracted to rain chains because of the tranquility and ambiance they add to a space. The soft, rhythmic sound of the rain trickling down the chain creates a serenity you won’t find in a standard downspout. 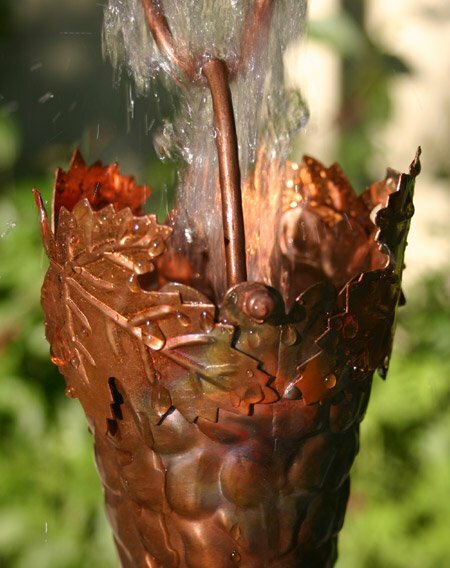 There is no better place to find your perfect copper rain chain than at GutterSupply.com. Not only do we help our high end homeowners find the perfect chain for their unique property, we also offer all the accessories you need for that “complete” look including rain basins and more. We carry one of the largest selections of rain chains you will find anywhere online. Better yet, every one of GutterSupply.com’s rain chains come with a complimentary gutter attachment piece so you can securely attach it to the home. Click here to learn more about our exclusive sale on rain chains. For a limited time, we are offering a 35% discount on all of our custom, beautiful copper rain chain products!